Honeymoon is a dream come true vacation that is long awaited by the couples, which marks the beginning of a lifetime journey together. It’s a perfect time to connect with each other in a blissful romantic way. What is more beautiful than spend some quality time with your partner with the best views of sunrise and sunset, while playing along with the pristine clear beaches? I’m sure all of you dream of a private honeymoon, where you can just be with your spouse far away leaving all the tensions behind. 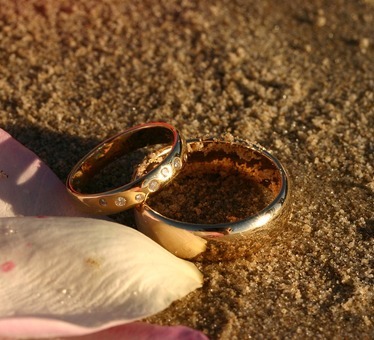 And what’s much better than choosing a private island to make your honeymoon a luxurious memory. Let’s take a look at which islands made it to my list! There is absolutely no doubt that this is one of the top must visit locations on my list, for its luxurious villas, the crystal clear water, private bungalows overlooking the water and more. Famous for its black – sand beaches, lagoons, waterfalls, 2 volcanoes, it’s a popular island located in the South pacific archipelago of French Polynesia. Spoilt with choices, Bora Bora Island is a perfect romantic escape for a honeymoon. Enjoy staying in a private overwater bungalow with delicious Tahitian BBQ lunch served at your villa. Explore the surrounding lagoons with a Shark & Ray snorkel safari during the day and a romantic evening watching the sunset followed by an intimate candle light dinner in the finest restaurants served on the beach beneath the stars. If you chose to treat your spouse to the best of Bora Bora, then surprise her with an exciting Jet Ski tour or a private cruise that comes with a complimentary professional photo shoot. Book a “Romantic Soiree” for a gourmet dinner with a dance show on the beach. Travel from one island to another on a adventure cruise in total isolation served with special champagne in coconuts served by the very friendly staff, who will also teach you how to spear your own fish to make your honeymoon a top notch one. Fiji is an island country with over 330 islands located in the South Pacific Ocean. Blessed with a tropical marine climate, the islands welcome tourists all through the year. For being the region with significant number of soft coral reefs, many tourists come with the interest of scuba diving. With the various number of visitors increasing every year, every island has been developed creating a romantic and cozy ambience for the couples. One such island is the Yasawa in the western division. The Yasawa beach resort offers stunning views, which is ideally located amidst 11 beaches. Choose to play tennis or relax by the pool or try windsurfing, snorkeling and kayaking or enjoy fishing and other activities offered by the resort. A well organized room with Fijian décor, private open air shower, a patio, a hammock, a massage deck offering stunning views of the ocean are added benefits at this resort. The restaurant menu features some fine menu created by locally sea caught food. For those who want to make it further romantic, a picnic basket is packed to dine under the stars. For some chilling time head to the poolside bar for exclusive range of cocktails. Enjoy energetic adventures, escape to relax in the island or design your honeymoon for a heavenly experience of Fiji island. As the name Yasawa truly lives up to the meaning of Heaven. Featuring just 11 villas, North Island is a perfect destination for a private romantic honeymoon. The architecture of this villas has been created with the essence of local architecture balancing luxury at its best. The shades of blue sea, the fusion of the environment, the mood lighting and the sophisticated forms of the spaces to create an authentic sanctuary of its own. Of course, a private outdoor pool with the beach view is a must on island holidays with a lot of water sports and fitness centre all overlooking the beach. The Island boasts of offering “Barefoot Luxury” meaning one can truly experience the magical touch of this space, barefoot! Whether you wish to visit in search of peace or to play, they make it happen just the way you want in a unique style. Be it sunset at a beach, lounging at a piazza, browsing the boutique or pampering yourself at the spa, North Island has it all. The combination of personalized and discreet services creates the feeling of an ideal private island, which provides enough justice to the word romance. When it comes to dining, there are various options to choose from; a luxury fine dining experience at the piazza or a well served meal in your own villa. You could also chose to enjoy the sunset at the beach bar with an exotic range of drinks. Though an expensive holiday, it’s worth every penny of experience and luxury. If you’re looking for a different experience on your honeymoon then look no further than the Lizard Island. It is one of a kind island that is literally located on the Great Barrier Reef which is about 1013 hectare in the National Park. The experience with 24 private beaches is just a marvelous one without finding another person on this island. Lot of guided tours are organized to explore the inner and outer reefs, the research station, nature walks, challenging hikes and much more. The restaurant menu is inspired by the local produce from the coast with a seasonal variety and flavors inspired by many cultures. Well, there is no compromise on luxury or the hospitality at this Island for a couple. It’s a must visit if you would like to become a sea explorer as this Island is listed among the Natural Wonders of the world, for the great reef stretches up to 2300 kms. It’s a pleasure and a rare privilege to be a part of this world for few days with your loved one to witness some breathtaking wonders of Giant Clam gardens, tropical fishes, manta rays, turtles and coral. Private picnic baskets are arranged for you to stay away and relax with your partner at a private beach. Also sunset beach dining is offered to end your day in a romantic way. The ocean view villas and the garden view villas are packed with privacy with absolutely stunning views of the sea and unlimited facilities. Honeymoon is all about having that private time out with your spouse to relax and connect after all the wedding stress. And what could be more perfect, than few days away from the regular life at a private island to relish some tranquility. No doubt these islands can cost more than your budget, but will remain money well spent for a memory worth a lifetime. After all it’s the quality time you spend that matters. Not just for honeymoon but if you’d like to take a break from the family routines and want some time off, then these destinations make up for it as well. Plan a surprise visit and treat your spouse with some romantic private getaway.